The Rolling Stones 1973 European tour, launched after the release of Goat’s Head Soup, is long regarded as one of the highlights of the band’s career. With Mick Taylor raising the bar with his guitar virtuosity, and The Glimmer Twins performing at the height of their ability, the Stones delivered live sets with a consistency rarely matched for the remainder of the decade. Although no live album was officially released from that tour, it did spawn many underground bootlegs cherished by vinyl collectors of Stones’ music the world over. One such recording, affectionately called Bedspring Symphony , continues to be regarded as a “lost classic” of bigger importance than some of the band’s officially released live album. 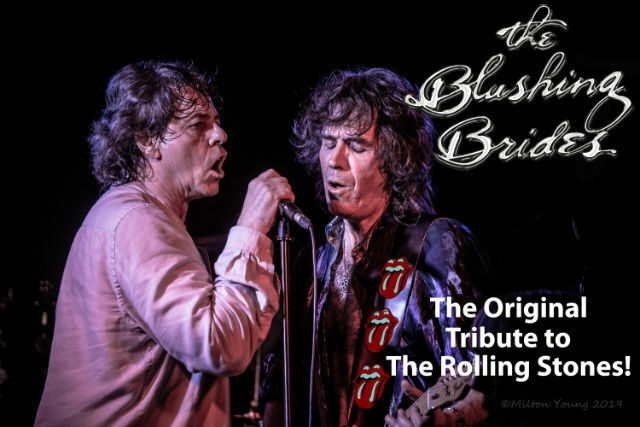 It also serves as the musical blueprint for performance by one of the best Stones cover bands Canada has ever produced – The Blushing Brides. You have to be rather committed to a band’s music to survive nearly 40 years as a rock and roll tribute; but when you’re paying homage to a band that’s in its sixth decade of touring, it kind of sets the bar for how long you can continue. There’s no questioning The Rolling Stones’ place in rock and roll history. Where questions arise, however, is why fans continue to fork out big money – as much as $400 face value for the Canada Day weekend show slated for Burl’s Creek – to see these saggy septuagenarians deliver their set of reverred rock and roll classics. Now into their fourth decade paying tribute to their musical heroes, The Blushing Brides continue to use the vibe on Bedspring Symphony as the template for their show. While their nightly set list is built with songs from all eras – including new songs cherry-picked from albums like Voodoo Lounge and Bridges to Babylon – the tempo of that classic recording is what the Brides aim to recreate through their performance. For Colgan, who spent hundreds of hours studying the nuances of Richards’ performance and his unique guitar tuning in order to deliver an authentic Keith, the song he most looks forward to playing is the extended version of “Midnight Rambler,” the band’s ode to Albert DeSalvo – a.k.a. The Boston Strangler.